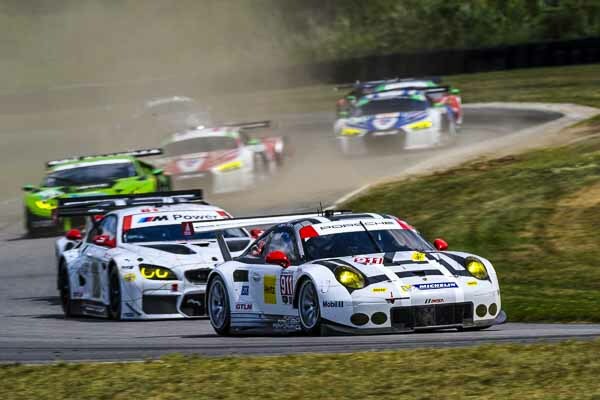 The #911 Porsche 911 RSR scored sixth place in the GTLM class at round seven of the IMSA SportsCar Championship in Lime Rock Park on Saturday. On the racetrack in the US state of Connecticut, the reigning IMSA GT champion Patrick Pilet (France) and Nick Tandy (Great Britain) shared the cockpit of the 470 hp GT racer from Weissach. A problem with the fuel supply after 27 laps cost the winners of the Long Beach race the chance of securing a better result. At the wheel of the sister 911 RSR (#912) run by the Porsche North America works squad, Earl Bamber (New Zealand) and Frédéric Makowiecki (France) had to throw in the towel after an accident while fighting for second place. In temperatures of over 30 degrees Celsius, the pair was ultimately classified as eighth after the 2.40-hour race. At just 2.414-kilometres long, this racetrack was the shortest on the calendar. Round eight of the IMSA SportsCar Championship will be contested on 7 August on the storied Road America racetrack at Elkhart Lake in the US state of Wisconsin.